Since the beginning of Google, pursuing key spots on search engine results pages (SERPs) for keywords has been one of the central goals of search marketing. Search marketers know what kind of traffic opportunities there are in the top results, so we relentlessly pursue them. More clicks lead to more traffic; so long as the traffic is qualified, this is a win for brands. Like all technology, Google is ever-evolving. Cutesy-sounding algorithm changes — Panda, Penguin, Possum — have brought scary changes for search marketers and forever altered the industry. The SERP itself has matured as well. Once upon a time, 10 blue organic links graced the front page of Google. Unfortunately, these glory days are over. Now, organic links have to compete with all sorts of result formats, called SERP features, of which there are more than 20 formats. 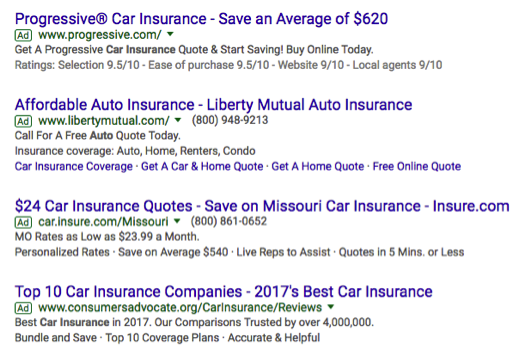 PPC ads outline SERPs with some competitive industries — such as insurance and law — showing up to four ads at the top. 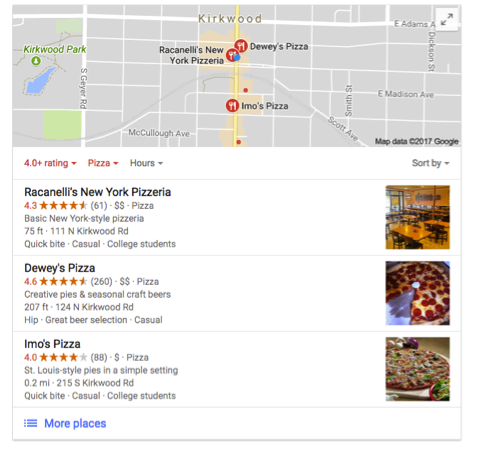 Maps have infiltrated local results, and news results have too swarmed search real estate. But one of the more interesting developments from Google has been the featured snippet. A featured snippet is a type of SERP feature that directly answers a user’s query in the SERP itself. From Google’s perspective, these sort of instant answers provide a good user experience. If users are happy, they’ll continue to use the service. Google will continue to make money; after all, it is an ad platform. These valuable featured snippets live above the No. 1 organic result, so SEOs have a new spot to target: No. 0. If search marketers are laser-focused on spot No. 1 without considering spot No. 0 opportunities, brands could be missing out on valuable traffic and awareness. Featured snippets are showing up on more and more SERPs. In April 2017, STAT Analytics found them to appear in 24 percent of overall searches, a 55 increase since July 2016 and 150 percent increase since January 2016. 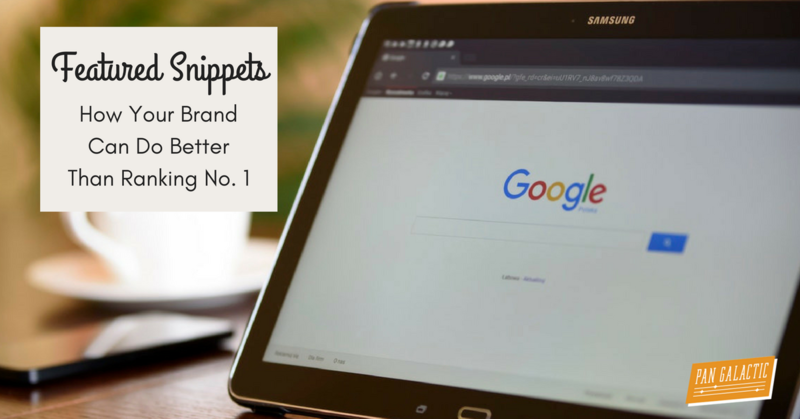 Snippets are shaking up the search space, and brands and marketers would be remiss to ignore the benefits they bring. 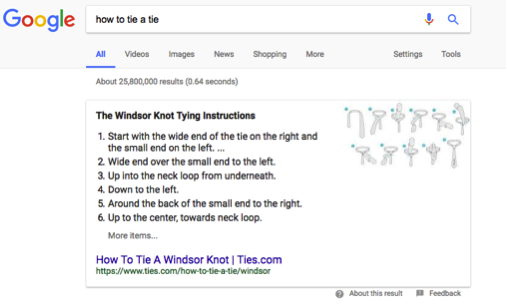 Featured snippets include the URL and the page’s title, thus giving the website that owns the snippet some bumped-up branding. They appear in three formats: paragraphs, lists, and tables. Google will display the format it feels best answers a user’s query. Of all featured snippets, ones formatted as paragraphs are the most popular, followed by lists then tables. A featured frequently shows up with question searches (e.g., what is, why does, how does). 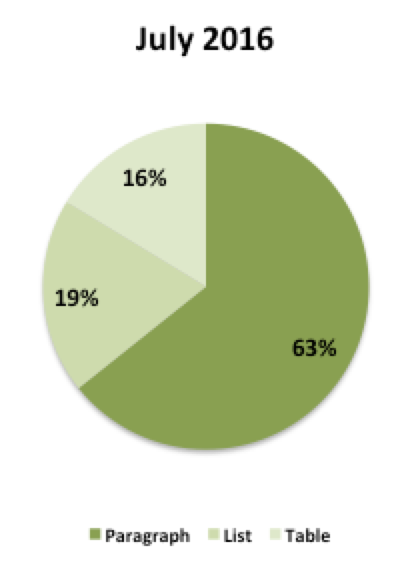 These are the most common, showing up in 60 percent of all featured snippets. Google will bold the keywords from the query that are used in the SERP snippet; using lexically similar keyword variants will result in more bolded keywords in the snippet. A featured snippet displayed as a list distills down the info on a webpage to a bulleted or numbered list, making these easy for users to quickly scan. A featured snippet displayed as a table is the least common snippet result, showing up in only about 11 percent of searches. These are harder for Google to format, and it can be hard for them to fully answer a user’s query. Featured snippets have many more benefits than they do drawbacks, and the positives far outweigh the negatives. Google chooses featured snippets from the pool of 10 organic results on the first page more than 98 percent of the time; thus, if a brand owns a featured snippet, the ranking URL appears on a SERP twice: in the answer box and in the standard No. 1-10 spots. STAT shows that Google typically sources featured snippet answers from spots three through five. If your brand is already ranking No. 5 for a query with a SERP snippet, it could be more valuable to target spot No. 0 first instead of No. 1. Getting a page from spot No. 5 to spot No. 1 can feel like an impossible mountain to climb. Going from spot No. 5 to spot No. 0 can be considerably easier if you make a few tweaks to your page. An Ahref’s study shows that spot No. 1 still has a higher CTR than No. 0; however, the same study shows that spot No. 0 could be stealing clicks from spot No. 1. If a brand is ranking for spots No. 3 and No. 0, they are effectively stealing clicks from the site is ranking No. 1. Featured snippets play a central role when it comes to voice search, making them even more opportunistic. 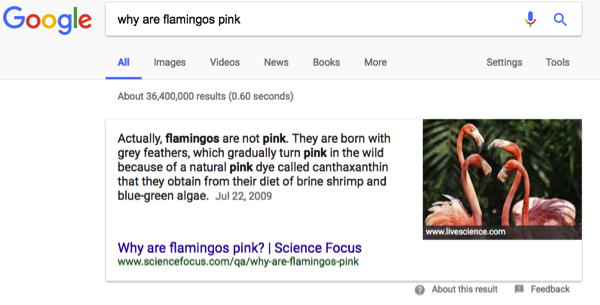 On Google Home, Google uses featured snippets in its answers. If you were to ask, “OK Google, how do I roast pumpkin seeds?” Google Home would recite back to you the directions pulled from the SERP associated with this query, along with citing the source. You might not get the click back to your site like you would from a traditional search, but users still hear your site as the reference, which boosts awareness. As of September 2017, Siri is now using Google as her source for web searches rather than Bing; it’s even more vital to own featured snippets on Google specifically. There are few disadvantages when it comes to owning a featured snippet. There is the risk that users will have their questions answered entirely from the snippet; they might have no need to click-through to the source site. 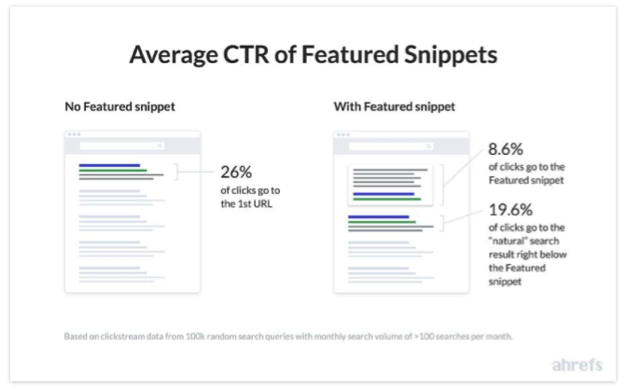 Ahrefs ran a study that did show that the presence of a featured snippet drives down overall clicks on the SERP. But there is anecdotal evidence that webmasters see an increase in traffic once their respective sites secure a featured snippet. Confluent Forms saw an increase in traffic once they won a featured snippet with that same traffic dropping off after the site lost spot No. 0. There’s also the question of featured snippet’s shelf life: If you own a featured snippet now, how long will you keep the space? 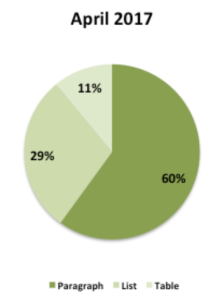 STAT released a study that showed that 68 percent of the keywords they tracked for 20 days showed no volatility in the featured snippets associated with them; 23 percent had low volatility, meaning the snippet changed fewer than five times throughout the study. 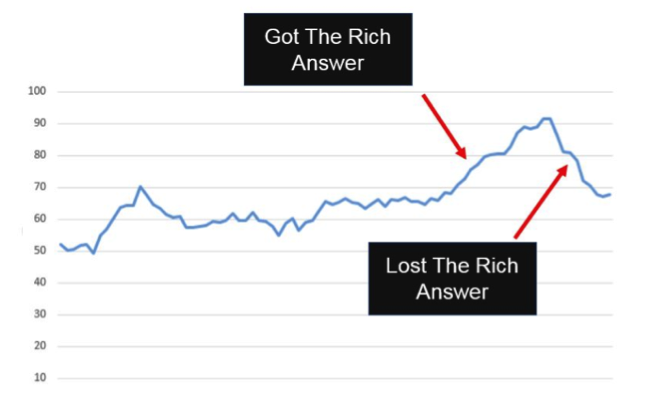 The study also showed that volatility increases as the snippet source position drops; snippets will no volatility were sourced from positions Nos. 3 and 4 whereas snippets with high volatility were sourced from positions spanning Nos. 3 to 7. If you own position Nos. 0 and 3, that snippet is likely to be less volatile than if you own position Nos. 0 and 7. To lower the chance of volatility, increase a keyword’s rank. Further, the study showed that the pool of URLs that Google pulls featured snippets from is small. As noted earlier, Google will pull snippets from one of the top 10 answers. 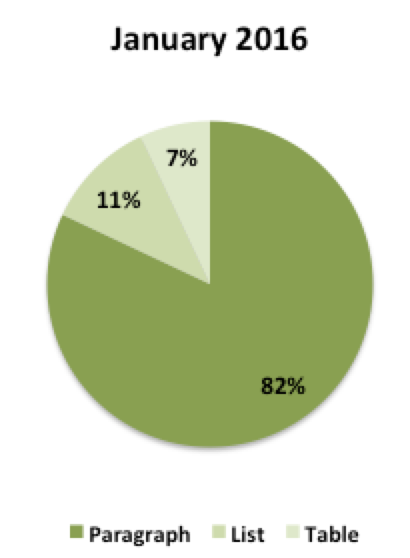 However, in 99 percent of featured snippets that STAT tracked, there were only one to three URLs associated with each snippet; if you own a featured snippet and lose it, you are likely only competing with up to two other URLs to get it back rather than all 10 organic results on the front page. Once you have decided to begin targeting featured snippets, the key is to understand where they exist in your industry and among your competitors. Look at the keywords you are ranking for on the first page. Which of those queries have featured snippets associated with them? For any that you don’t own, look at the page that is winning and see what that page is doing better than yours. Remember that you have a better chance of getting a SERP snippet if you are ranking in position Nos. 3 through 5 and that the lower the rank of featured snippet’s source, the more volatile it will be. Once you know the query you are targeting, take care to optimize your copy so that Google will be able to easily snip the information to display on the SERP. Use the query as a header tag in the content (an H1, H2, etc.). Looking at the data, it’s clear that Google isn’t abandoning featured snippets any time soon; the result format is only increasing across the SERPs, and with the advent of voice search, featured snippets are finding their way off the SERPs as well. Now is the time to include featured snippets into your search strategy so that you aren’t losing this valuable real estate to competitors. Pan Galactic Digital is a digital marketing agency focused on digital content strategy, search engine marketing (SEO and PPC) and social media programs. Pan Galactic has worked with clients such as Eastman Chemical, Nestle Purina, Microsoft, MedData, Sun Chlorella USA, Learning Ally and Cardinals Nation, as well as partnered with marketing agencies, to provide digital strategy and execution.